SINGAPORE - Retail sales were lower than expected in October, according to figures released by the Department of Statistics on Wednesday (Dec 12). Takings at the till that month were only 0.1 per cent higher year on year, below the 1.5 per cent increase forecast by analysts polled by Bloomberg and coming off the 1.9 per cent rise in September. Excluding motor vehicles, retail sales rose 0.5 per cent. Car sales fell by 2 per cent year on year. This retail performance was weaker than analysts had expected, with Bloomberg polls predicting a 1.5 per cent rise. Due to continued high petrol prices, sales at petrol service stations increased 11.4 per cent compared to last October, recording the biggest percentage gain among retail segments. But after removing the price effect, in volume terms, the increase recorded was 1.5 per cent. 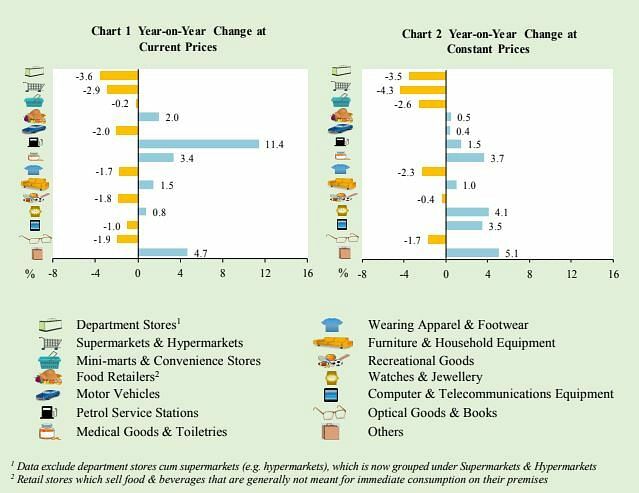 Apart from petrol sales, food retailers, medical goods and toiletries, furniture and household equipment and watches and jewellery sellers registered marginal increases in growth. However, sales at department stores dropped by 3.6 per cent and supermarkets and hypermarkets saw their takings dip by 2.9 per cent, compared to October last year. Retailers of optical goods and books also recorded sales declines of 1.9 per cent, while those selling recreational goods saw a drop of 1.8 per cent. The total retail sales value in October was about $3.7 billion. Of this number, online retail sales made up an estimated 5.3 per cent. Compared to the same period last year, sales of food and beverage services increased by 1.1 per cent in October this year. The total sales value of this sector was estimated at $710 million, higher than the $703 million last year.